Product Weight (Less bucket, thumb, and fluids) – 675lbs Shipping Weight – 900lb. (We ship these double crated in strong iron crate, then crated inside a wooden crate for guaranteed protection from any damages / lost parts) Hydraulic Volume 3’4″ Requirements 3 to 4 GPM *We include a PTO pump so its self contained. Hydraulic Pressure Requirements 2000psi Recommended Tractor HP 16-25+HP. 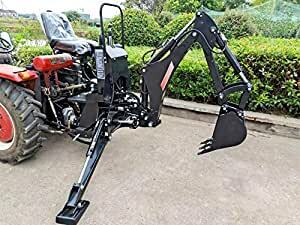 Connects to a Category 1 Sized 3 Point Hitch. Ships LTL freight curbside.